Let’s unpack some fresh stats today to help interpret the market and see trends as they are unfolding before us. In the past month I’ve shared about hedge funds, cash and FHA, but let’s throw in conventional sales into the mix today. What is the quarterly percentage of FHA, cash and conventional sales in Sacramento County over the past few years? The chart below shows all sales under $200,000. Why have I been focusing on the market under 200K? This is why: 35% of all sales in Sacramento County this quarter have been cash, but 49% of all sales under $200,000 have been cash deals during the same time period. As you can see, cash has been devouring the market – particularly in Q4 so far. Conventional sales have seen a slight uptick from previous years. FHA deals have been suffering as cash has trumped the market. What else do you see? Does anything surprise you? Unemployment Rates & Hostess: Jobs are an important economic indicator. When interpreting real estate stats, I tend to go back to how many people are working in the Sacramento area. This impacts people’s ability to purchase as well as how much house they can afford too. 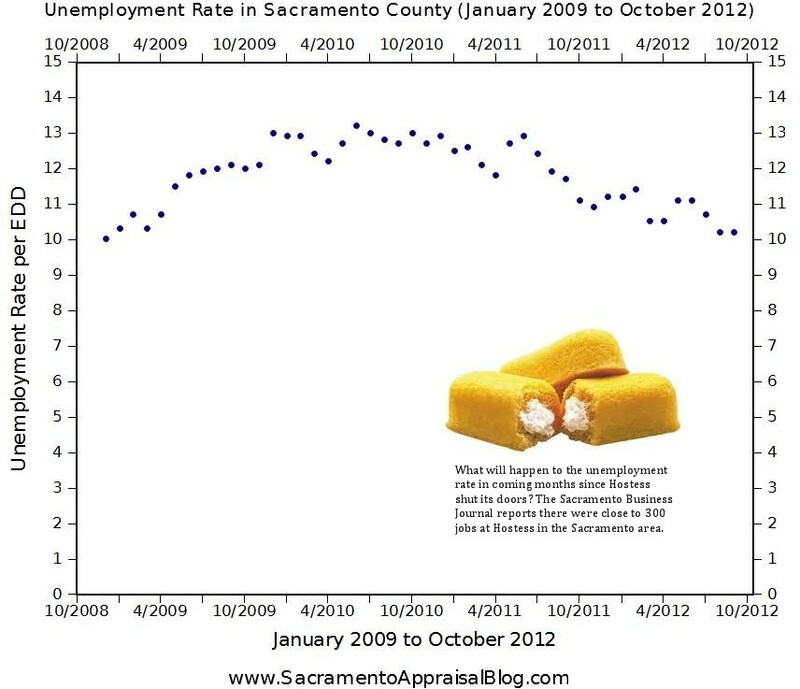 Click on the thumbnail image on the side to see the trend of unemployment in Sacramento County over the past few years. Do you think we’ll see lower numbers next month in light of Hostess closing its doors in Sacramento? Feel free to use the image on your own blog or website (please use according to my sharing policy).